A man was attacked by 3-4 men outside his home in Cranbourne Road, Muswell Hill at around midnight recently, the carjackers made off with his £20,000 Jeep. This follows the attack on a 25 year old woman in Roseberry Road who was relieved of her £40,000 Mercedes. Police are warning residents to be extra cautious when in their cars. motorists are advised to drive with the doors locked, be aware of other cars when parking and to keep a safe distance from the car in front. Being short of cash Haringey Council want to sell off plots of land around Alexandra Palace Station. They also want a mega 'Haringey Heartlands' development with about 10,000 more people, shops and bus stations by the station. The heart of heartlands will be a Piazza just like sunny European cities where one can stroll around in gardens and sit at the outdoor cafes reading the Muswell Journal and viewing attractive people walking by. The development is planned to take 6 years to complete, but will no doubt take much longer. This means 6 years or more of construction vehicles and lorries using the surrounding streets to access the site. Furthermore the bridge will widened to make this possible. Given the already disastrous efforts of Haringey Council in traffic control, it will mean residents living in a building site for 6 years or more. Click here to comment on this article? In their bathroom shop you will find everything you will need to build or simply make over your bathroom from the Traditional to the Modern. Their clients range from the infamous to pop and film stars. 43 Muswell Hill Road, London N10. Click on the image and access 192 directory enquiries for free. Muswell Hill has recently suffered a spate of car thefts carried out by burglars who first steal the car keys, left on hallway tables by owners. Burglars have taken to using a bamboo pole with a hook attached to fish the keys from hallway tables or wall mounted key ring holders close to front doors. Several expensive vehicles have been stolen using this method. Muswell Hill Net Website Design. 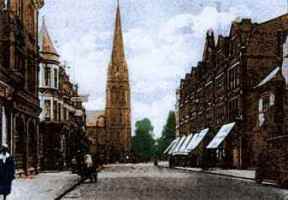 Then visit Muswell Hill Net's website. Have you placed your advert yet? Want to visit the local community website?